This game will measure your memory. Several letters will appear each one has their partner. You rotate them to see what letter it is. When you find two matching cards, they will disappear. Find the pair of each letter. 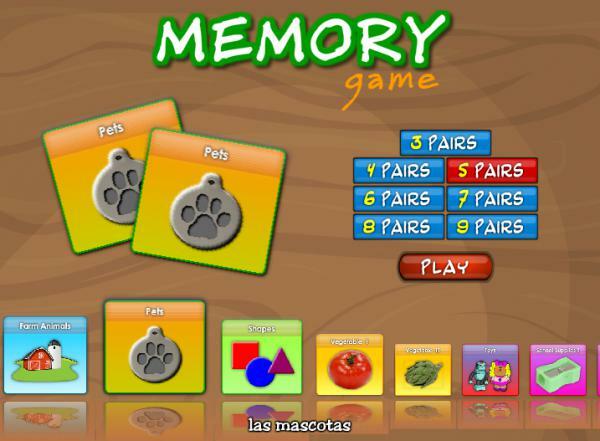 Exercise your memory with this funny game. You will have to find the pair for each couple the quicker you can. So, squeeze your brains and so you are a winner. With this game, in addition to listen to lots of different words in Spanish, due to repetition and the attention exercise you should pay, it will be easy for you to learn a lot of vocabulary and its correct pronunciation.